This jumping girl is Hana, my nephew. Look at her feet, they were on the air! She loves playing on the beach. 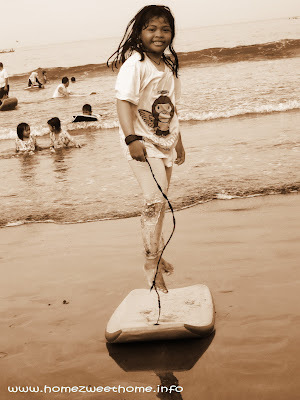 This jumping moment was captured at Pangandaran Beach (Ciamis, West Java, Indonesia). It’s my entry for a new photo meme, Weekend Portrait, hosted by Dindin MK. Don’t be hesitant to share your portrait photos there! Lovely portrait. I like the way you toned the image. Very tastefully done. your niece is cute....she did awesome! Great capture. She is pretty. My first time to hear this meme. I will check out the link. Love to join.